Today’s demo. Rain, cold, frustration and a disabled man stranded in Ashton. Food parcels gone in 25 minutes. Today was pretty grim to be honest. I’m sure that you are most likely fed up of me saying this now but it was. The weather was awful, rain was pouring down and it was cold. It felt more like autumn not summer. The reason for my mood not being brilliant was simple. I had received a message saying that they thought that the demos aren’t going anywhere amongst other things. I, and other members beg to differ. The demo has been happening for nearly four years now, every week, and there has never been a week off. We have helped countless numbers of people, advised them, fed them, prevented suicides and also we have and still do empower people to challenge the system. This is the best form of retaliation against the government that there is. It worked during the poll tax years, and it’s working now. We also have started a countrywide movement, which is no mean feat and have created massive awareness both in this country and worldwide. So once again I disagree. Doing extra days was also mentioned. Yes these are already planned, but organising these isn’t easy because people have personal commitments. But I will keep you posted. Rant over, I shall get back to today. Photo taken on a day when we had some decent weather. The food parcels arrived, and the queue had already formed. Most were taken straight away, the last taken 25 minutes later. The reasons for needing them vary from unfair benefit sanctions, to ESA medical failures. We are a rich country and for f###s sake, people should not be going hungry, especially when the government can afford to give the DUP £1 billion to bribe them into joining an immoral at best coalition so that they can remain in power. People are dying but not many care!! We spoke to a man that had been refused his ESA and the Jobcentre are refusing to acknowledge the reason for his sick note, of should I say ‘fit note’. What an inappropriate name. If you were fit you wouldn’t need one would you. Because he had read our leaflet, he is challenging this as is off to Citizens Advice as I write this. The leaflets do help loads. Thanks Roy! I spoke to a woman who was rushing off, she looed upset so I stopped her and asked her if she was ok. She said no, that she was hungry and was waiting for her money to come through. I offered her the last food parcel and some extra bread. She was overjoyed. We had given her hope. We spoke to an older man, who told us he was disabled. He told us that he claims ESA, and we could see that he struggles to walk. 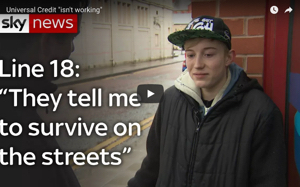 His ESA hadn’t been paid to his account and he wanted the Jobcentre to help him. To make matters worse, he had travelled from Oldham and had no money for bus fare to return. He thought it would be like the old days and they would reimburse him. They didn’t help him much except to tell him that they didn’t know why it hadn’t been paid. Their methods of communication astound me. They’d do better if they used a tin can with a string connected to another one wouldn’t they. But he was clearly upset because he didn’t know how he would get home. We immediately did a collection and gathered the money together, and he asked how he would pay it back. We replied saying that we didn’t want the money back, we just want you to get home safely. I don’t think that he could quite believe that people could be so kind. An elderly lady who had missed her pension and had been forced to sign on said hello to us. We have spoken to her on many occasions previously and we had helped her and showed her friendship. Today was a good day for her though. This was the last day that she had to sign on, because she will be receiving her pension. We all gave a resounding cheer and I even did a little dance. I could see that she was happy, and I doubt that she will be going near a computer in the near future. We gave lots of advice and leaflets out today. Like I’ve said the reasons are varied, young people struggling to get on the system, disabled people refused their rightful ESA benefits, women with babies and small children and older people. All are let down by the system that was originally put in place to support them. The benefit cap is having a massive effect on my town, and I suspect nationwide. It won’t be long before their evictions take place. I offer advice about this all the time in my everyday life and I wish that I had a magic wand but I don’t. It’s wrong that people are suffering like this, and babies are being punished because their birthday was after the cut off date. No child should ever go hungry, ever. Remember folks, this government respects no one but itself and it’s hunger to be in power. I’m positive that they will bring in more austerity measures that don’t need to be implemented. Austerity is a political choice not a necessity. 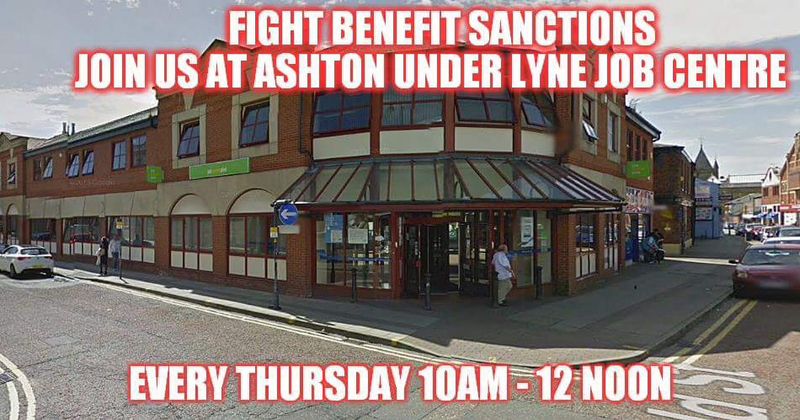 And for as long as this continues I will be outside Ashton Under Lyne Jobcentre whether people approve or not. It’s simple. People need help and I will give my help and advice, so will my colleagues who are a pretty amazing bunch of people, and I really do appreciate them all. Together we can continue the fight as well as help others on the way! Please read, share and talk about this blog. Doing that in itself is fighting back against the government. A massive thank you to those that already do! I do appreciate you all. You are fab! This has also become a full time job for myself, and if anyone would like to donate just click on the button below. Thank you! http://www.paypal.com/cgi-bin/webscr?cmd=_s-xclick&hosted_button_id=K47PHPHS5XYRC&#8221; target=”_blank” rel=”nofollow noopener noreferrer”> . ﻿Food parcels gone in ten minutes, unhelpful Jobcentre staff. No surprise there sadly. Today’s demo. Sunshine and stress. I’m so glad Charlotte and Co are there to help without them there would be no food no advice and no solidarity for the unemployed and disabled of Ashton. Thanks to their work, others were inspired to do the same in places like Darwen Lancashire, and Ellesmere Port Cheshire. This vital lifeline becomes even more so due to the length of austerity now – 7 years is such a long time to suffer cuts and poverty. You are an inspirational bunch of people, a great asset for your community. Bear in mind that Cameron (he with the unusual interest i severed pig’s heads) vowed that austerity will go for good. Hopefully a few by-elections will deprive the Tories of the majority they bought from the DUP using our taxes. Well done great work inspiring. we need you guys at all the job centres I try to help and always tell people to google job centre rights etc so much so ive relay peed off the jc locally. You inspire the rest of us just by being there for people, I know a few years ago I didn’t know where to turn for help and there was nothing where I was so don’t ever underestimate what you do just by listening and advising let alone feeding people. Thank you for what you do. Whoever told you that you should finish your protest hasn’t a clue about life under Tory Austerity. The work you are doing is vital to so many people – and I’ve no doubt whatsoever that you have saved many people’s lives – and sanity – with your wonderful advice, food parcels, and the love and kindness you all show every week. It certainly is Theo! Keep strong!